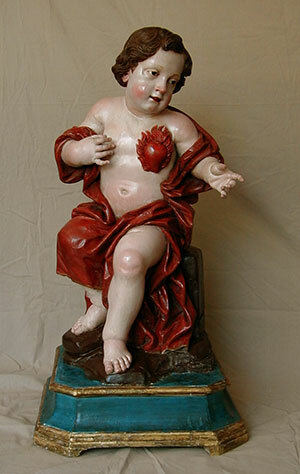 Polychromed refers to painted (and at times gilded) sculpture. Although most frequently polychromed sculpture will be carved from wood it can also be made from plaster, terracotta and stone. 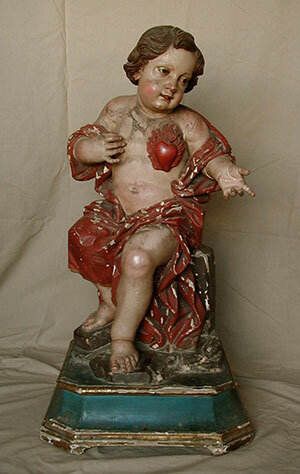 This sculpture, from a follower of Giuseppe Sanmartino in Naples, is carved from wood. 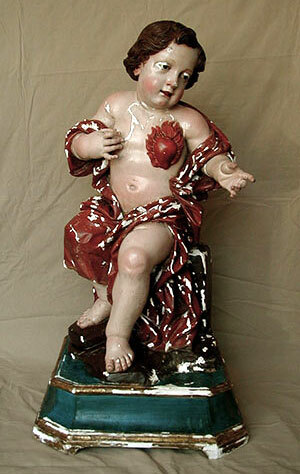 the carved wood was covered by gesso (composed of animal glue and chalk) and was then painted to appear lifelike. The architectural base of the sculpture was also painted and gilded. This sculpture arrived to Sherman Art Conservation with active flaking paint with losses, small missing areas of carving, old retouchings and a thick grime layer. Flaking gesso and paint is a frequent problem with wooden polychromed sculpture. This is for several reasons but probably the most frequent is that as the wood expands and contracts in responses to changes in relative humidity, the gesso cannot follow the dimensional changes and falls off. Filling the missing patches of gesso is time consuming as the fills are must be perfectly carved to perfectly match the surrounding surface.